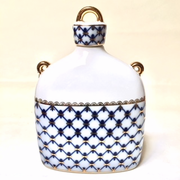 Cobalt Net bone china sake bottle with blue gold net design on bottle and lid. Gold loop detail on bottle and lid. 4 7/8" width and 6 7/8" in height.